The Metuchen Travel Soccer Club has established the Kelley McCaffrey Memorial Scholarship Fund in honor of Kelley’s past accomplishments in travel soccer and in the Metuchen community. Kelley was a long-time member of the Metuchen Galaxy girls travel soccer team, joining the team as a U10 player and playing with the team through the U19 level. 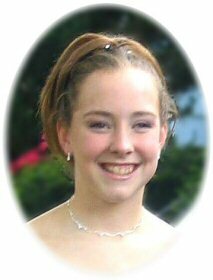 We lost Kelley in a tragic auto accident on September 6, 2004. Kelley’s fierce dedication to team is an example to all of us who participate in team sports, and who see the importance of dedication to team, to family, as an outstanding character trait—on and off the field. Such dedication led to Kelley’s being named Captain of her varsity soccer team at Bishop Ahr High School. To remember Kelley’s unique and long-lasting contributions to soccer in Metuchen, and to continue to spread her spirit of dedication to team, the MTSC will award several scholarships each Spring in Kelley’s name. Covers up to $300 towards MTSC registration or summer soccer camps. Awarded to MTSC players (two boys and two girls) consistently demonstrating the highest level of commitment and dedication to team. Awarded to the women’s varsity senior soccer player demonstrating the highest level of commitment to team during her senior season. This Scholarship program is administered by the MTSC as a separate program within the MTSC organization. All contributions to the Kelley McCaffrey Scholarship Fund will be used exclusively for this Scholarship program. We are asking everyone in the Metuchen community to make a contribution to this Scholarship Fund, no donation is too small. Please share this information with others in the community who would be interested in contributing to this scholarship program in Kelley’s memory.